A cold winter’s evening. Manchester United away against Crystal Palace at a packed-out Selhurst Park. Eric Cantona, United's mercurial talisman, has been man-marked closely all game by Richard Shaw and become increasingly frustrated. In the 48th minute, Cantona’s temper boils over, and he kicks out at Shaw. The ref shows him a red card. On his way off the pitch, a Palace fan rushes towards the hoardings to hurl abuse. The Frenchman loses it. He launches into the crowd, aiming a kung fu kick at the fan’s chest. He is forcibly restrained and then taken off down the tunnel. The football world is stunned. Nothing like this has ever happened before. What followed has entered football folklore: the media furore, the seagulls following the trawler and the longest domestic ban ever handed to a player; it would end up lasting 250 days. As Manchester United’s campaign stuttered towards a trophy-less conclusion, surrendering the league on the last day of the season and losing the FA Cup final, Cantona withdrew from the public eye. But behind closed doors, Ferguson was planning the most remarkable of fresh starts for his star player and for a new-look United. 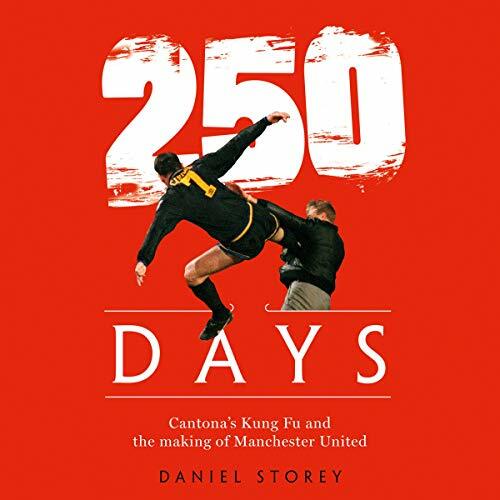 250 Days tells the story in brilliant detail of one of the most turbulent times in United’s recent history. Showing Cantona in a new light and the genius of Ferguson’s man management and vision in close relief, it is an incredibly entertaining and insightful look at the most controversial episode of the Premier League era. The narrator's poor attempt at accents are a major negative. His poor attempts at mimicking the accents of Sir Alex Ferguson and Eric Cantona would be more at home in old British sitcoms such as 'Allo 'Allo! or Mind Your Language. I loved the content of the book. The narrator's delivery was generally excellent, but knowing the actual voices and accents of those involved his impressions took me out of the book (particularly Roy Keane who was given generic Irish accent rather than the distinctive Cork accent he has). The idea was fine but its difficult to implement so I would have preferred it being read out normally.